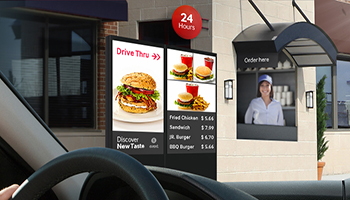 Digital menu board technology that’s being used in fast food drive-thrus to boost sales is now also being adopted to boost sales for a very different business: automated car washes. A Florida-based supplier of car wash solutions has added daylight-readable digital menu boards as a drive-up lane option for its operator customers. The screens are a means for car wash owners to influence sales on their services and options, and to dynamically vary prices by time of day and even weather conditions. Sonny’s — The Car Wash Factory has been selling car wash solutions since 1949 and sells more conveyor-based car wash equipment than any other company, globally. There are some 850 car washes run on Sonny’s equipment. This year, Sonny’s added super-bright, weather-sealed digital menu board technology from Samsung to its product line, intended to replace the print-based signs that motorists normally see when they advance along the drive-up lane at car washes. Menus are one of the first impression points of a car wash, explains Regi Flanagan, VP of CarWash Controls at Sonny’s. “Right now, the menus that you see at a car wash when you pull up are pretty stagnant. You’re going to see the washes that the car wash offers and the prices. It’s not something that gets changed very often,” says Flanagan. “So having something like a pre-sell screen can promote any specials and start to eliminate the need for some of those other signs that you would see around a car wash property.” This can also help businesses move away from putting up hard-to-read makeshift signs to try and drive promotions. Customers weren’t asking for the solution, but it was obvious to Sonny’s that there was a better way to do things that could have offers changed digitally, on demand and be visible in drive-up lanes even on the sunniest, glare-filled days. Flanagan says Sonny’s started working with Samsung on a prototype, and tested an IP56 weather-sealed unit at its facility for six months, before taking a finished product — called Outdoor Digital LED Menu — to market early this year. By the fourth quarter of 2017, there were 25 installed at customer sites around the United States, and another 40 or so at the Sonny’s factory being prepared to ship. With roughly 10,000 tunnel car washes in the U.S., and many with two or even three wash lanes, there’s a potential for 20,000 or more drive-up screens. The first installation was in the relatively easy environmental conditions of South Florida, but the displays have been proven to work just as well in the much harsher winter climate of New Hampshire and the extreme heat of Arizona. The all-in-one displays have auto brightness sensors that adjust from 200 nits at night to as much as 3,000 nits in direct sunlight, run 24/7 and can handle temperatures ranging from -22 F to 122 F.
There are several daylight-readable display options on the market, but Flanagan says Samsung’s OH series was a logical option because of the company’s leadership position in the display industry, and their willingness to collaborate on a final engineered solution tuned to the unique demands of the car wash environment. “They sent us a few displays for us to basically try to break,” he muses. Thankfully, they didn’t. The screens are all managed using Samsung’s MagicINFO content management platform. Promotional menus can be developed day by day, hour by hour, for a year or more, at one time. Most of Sonny’s customers have a managed services relationship, with Flanagan’s team monitoring the status of the displays, troubleshooting any issues, and making content and scheduling changes using MagicInfo’s cloud-based technology. With screens only in the field a few months, it’s too early to develop a rock-solid ROI model, but the tests done to date suggest the investment pays off. The drive-up lanes may only be the start of the digital signage story in car washes, as Flanagan says customers are also now asking about getting screens inside eating areas and elsewhere.